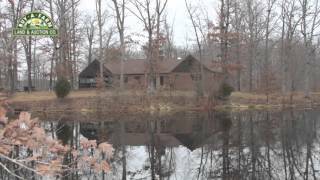 103 Acres Marion County IL All brick 3-bed home on 103 acres of managed timber with two lakes. Great fishing and hunting! 103 acres with an all brick home and 2 lakes. The home is set on +/- 40 acres of managed timber between two stocked lakes among beautiful oaks. Relax on the 3-season porch and watch the wildlife that surrounds you or look out of any of the many windows. This nice 3-bedroom home has 2.5 baths, formal dining and living areas and a wood burning fireplace in the family room ready for you! Fish in either of the lakes and hunt on your own property. Across the road is the additional 63 acres that has 20 acres in CRP providing $2,487 in annual income. Two concrete block buildings and an open side building can be used for storage or a workshop. Good blacktop road with low traffic provides access and privacy. It doesn’t get any better than this! South Central School District. Taxes $ 3,384. Directions: North from Salem on Interstate 57, 10 miles to Kinmundy exit. Head west on County Road 1050 E approximately 2 miles, left (south) onto Bilek Road. South about 1 mile to Green Ridge Road. Turn right onto Green Ridge. Property is on the left in about 1-1/2 miles where Green Ridge intersects with Gray Road.